Guggenheim Mobile Circle-Square (FMGUGGEN) at Pure Design / Accessories / Flensted Mobiles ::: Furniture for the Home, Office, Home Office, and More at Pure Design Online! This museum quality mobile, hand-made in Denmark, has been created especially for the Guggenheim Museum in New York. It arrives in its box fully assembled, approximately 34" in length and 15" in height. 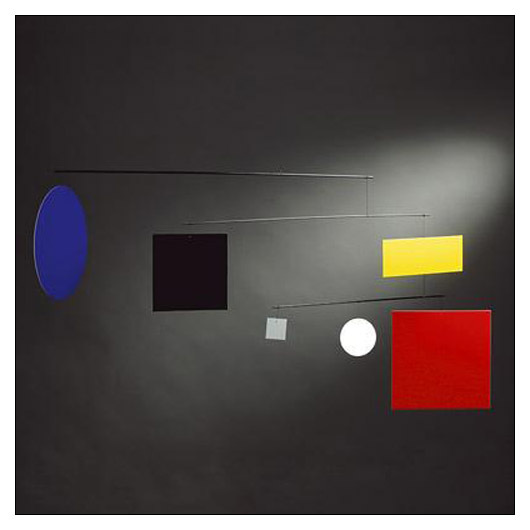 Designed with primary colors and forms, this bauhauslike mobile is also called the "Mondrian" mobile. 27.5" x 8" x 1.25"